How do you feel when you see that little plastic floss container in your medicine cabinet? Eagerness to achieve that clean feeling in your mouth? Or regret over a habit you have trouble keeping? However you feel about floss, one thing is true – this habit is equal parts simple and incredibly effective for improving your oral health. Bangor dentists Creative Dental Solutions share more below about why you should floss, how to floss, and what to do if flossing causes your gums to bleed. Floss is a simple thread designed specially to clean between your teeth (the hardest spots in your mouth to reach) comfortably and effectively. 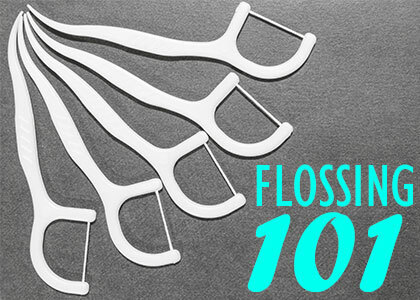 Floss was invented around 1820 and was first seen on store shelves decades later. There are countless brands and types of floss. It can be thin or thick, flavored or unflavored. Most often, floss is waxed to help it move smoothly between and around your teeth. When buying floss, be sure to find one that has the ADA Seal of Acceptance (it looks like a small square) to be sure the product is both safe and effective. Your toothbrush and floss go so well together, they should be married! In addition to brushing your teeth twice a day, it’s recommended that everybody floss once a day (even small children). Used together, brushing and flossing are crucial habits for maintaining good oral health and a beautiful smile. According to the American Dental Association, flossing can remove up to 80% of the plaque on your teeth. Plaque is a naturally occurring substance in your mouth, but it must be removed regularly to prevent cavities, gum disease and bad breath (halitosis). Over time, plaque can build up and become very difficult to remove. Brushing and flossing every day gives you a head start on maintaining healthy teeth and gums. You may see some recent research that says flossing isn’t necessary if you already brush your teeth. But dentists still recommend flossing, because floss is the only method that can completely clean the tight spots between your teeth and around the gumline. Pull about 1.5 feet of floss out from the container and hold it tightly between two hands. Gently guide a section of the floss between two neighboring teeth. Curve the floss in a C-shape around one tooth and rub the tooth slowly to dislodge any debris. Keep the floss close to the spot where your teeth and gums meet (the gum line). Use medium force while moving the floss up and down, away from your gums. Continue this same process on all of your teeth. A floss threader or a tiny interdental brush can help you floss if you have a bridge or braces. Talk with your Bangor dentists if you have specific questions about adopting your own flossing habit. You can also look for instructional videos online if you would like a good visual example of how to floss properly. It’s common for your gums to bleed just a bit when you first start flossing, but it shouldn’t really hurt. Blood is a sign of sensitive gums that really need a cleaning—so you’re on the right track. Don’t stop flossing if you experience bleeding gums. Gums bleed when there’s so much buildup between your teeth that it hardens and sticks to your soft gum tissue. Vitamin deficiencies, some medicines, and gingivitis (early stage gum disease) can also cause bleeding. In extreme cases, only a licensed dentist or hygienist will be able to remove old plaque. See your dentist if bleeding is persistent, painful, or excessive. Your Bangor dentists Creative Dental Solutions provide professional dental cleanings and consultations. Make an appointment today and show your mouth some TLC!